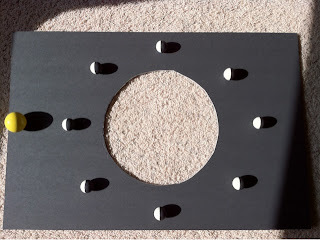 This moon phase board was fairly easy to make. After making a run to the Dollar Tree and rummaging through our science storeroom to collect the needed supplies to make this, it was pretty inexpensive and so worth every penny! Essentially, this Moon Phase board allows students to visualize and better understand the cause of moon phases and comprehend the 2 different views that are often given on a diagram (view from space and view from the Earth). Up to this point, I've done a Lunar Lollipop Investigation, which I thought was great, but this beats it by a long shot! 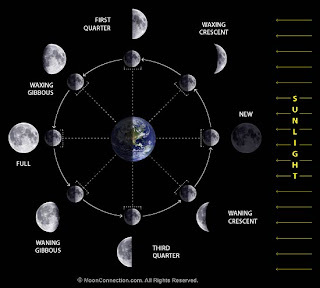 A large majority of my students don't really understand why the lit part of the moon doesn't face the sun on part of the view as seen from Earth on every moon phase diagram (see below). Even though I give many different examples and explanations, I still see a puzzled look on several of the students' faces. I really think this method will clear it up for even those puzzled kiddos. 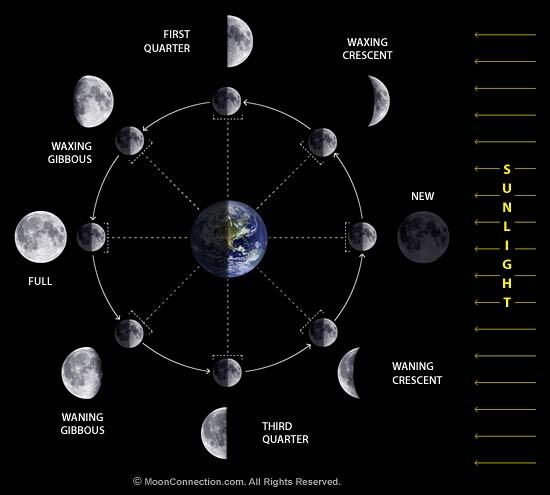 From this angle (see below), students can quickly see that the lit part of the moon is always the side of the ball that is facing the sun. Besides her inspiring stories, I was most impressed with the powerful one-liners she shared with the audience. It was like an Oprah show for Educators... A-Ha! moments abounding. I wanted to share some of her most inspirational one-liners. Everyday, Asenath makes her school announcements and she closes by saying "When you leave here today, you should be smarter than when you got here. Because smart is what you get, not what you are." What a powerful, empowering comment to hear and be reminded of every day. So many students become bogged down with their home lives and their individual circumstances, but we must hold EVERY student to the same expectations that we would hold our own children to. Each individual must be motivated to create a future for themselves. "No body can hold you back, except for you." Asenath says that it is "our job to take away their shoes and give them wings." "Don't try and make the kids fit the school. Make the school fit the kids." We need to do a better job of marketing the courses we offer. Every other media source targets our students and does a great job of marketing to them, so why shouldn't we. When she began offering an Anatomy and Physiology course in her school, they placed signs around the school that said "This class is only for smart people, dummies need not sign up." "There can't be a rule against something no one has ever done before. Don't tell yourself no, let them tell you." "You can't learn everything you need to know in a school building." "Give them time to think about what you're teaching them." Asenath began a garden (that more resembles a farm) in the middle of Detroit. She feels strongly that these young women need to know how to provide for their children to avoid the path of poverty, and this is one way she has fostered their learning outside the walls of the school building. She has taken girls to South Africa to teach the people about sustainable growing. One of the Catherine Ferguson girls commented after the trip, "My son will never be a neighborhood boy. He will be a man of the world." What a gift to give a young woman and her child! There were so many more one-liners that have inspired change within me. I hope you have the opportunity to hear her speak or meet her in person, but if not, she has some great videos on YouTube. And with a sad face ): I must pack up this laptop and head home...what a great experience the SXSWedu Conference has been. Now back to the classroom to inspire my students with new vigor and purpose. More than anything, I've learned that in this ever-changing world, I must allow my students to discover what truly inspires them and do everything I can to support that. I just attended a discussion with Alan November of November Learning. He discussed how we as educators need to be willing to let students use the technology that is at their fingertips. Despite all of the concerns that we have, students should be using their phones and other electronic devices to access information. As the discussion was going on, I began thinking of ways that I could incorporate technology into what I do. Considering that parental involvement is the single most important factor of student achievement, I want to integrate technology ideas that will involve the parents of my students. Up to this point, I haven't been a huge Twitter person, but I am beginning to see how its use in my classroom might be beneficial. This year, I began using the Remind101 app to remind my students (and their parents) of upcoming assessments and activities. I have even used it to pose questions to the students, but the missing component has been the ability for students to respond to me or have discussions with each other. Collaboration is a 21st Century skill that all of my students need, but I haven't been allowing it to take place...mostly out of fear. We are told to limit our communications with students, to keep things professional (which I totally understand and agree with), but shouldn't learning be able to take place outside of the school day? Shouldn't our students be taught the skills of collaboration that they need? Doesn't this happen 24/7/365? And don't we need to include the parents in the learning process (considering their involvement may determine whether or not the students will prove to be successful)? In order for this to be done correctly, students need to be taught digital etiquette & citizenship, and we, as a school, need to do everything in our power to insure that EVERY parent has the ability to connect to these resources. We cannot continue to wait for 100% of our families to be connected to the global world. Surely there was a time when all families were not able to purchase paper or basic school supplies for their children, but did education come to a halt? No, educators and schools took whatever actions were needed to bring every student and their family "up to speed" so to speak. Maybe families don't have the wi-fi needed to connect to the internet, but just maybe there is a local store (or even your school) that can provide that resource for free. So, what can we do to get every parent connected to this new digital teaching world we are upon? It is going to take baby steps. First, we need to incorporate it in our individual classrooms and find ways to get all of the students on board. For me, giving every student a laptop/ipad and getting them connected to the web at home, just isn't feasible. So what can I put in place immediately? For the most part, a large majority of my students have a cell phone (or a parent that does) and the majority also have texting capability. (By the way, I live in a small town, with a very large minority population and an ever-growing population of Mexican immigrants who speak very little, if any English. A little over 50% of our students are economically disadvantaged and at-risk.). So using Twitter as a method of communication and collaboration would be a simple addition. I can foresee posting pictures of what's happening in my classroom because it would be great to allow the families access and a look into my classroom! And I'm sure you parents can agree with me, but isn't it annoying when you ask your child what they learned at school, and their response is "I don't know." So if I begin posting questions for parents to ask their students about that evening, it gives families a conversation starter and my students will be continuing their learning outside of the school day- what an awesome gift! My ideas are flowing, but I want to be realistic in what I can easily implement. I'd love to hear from other teachers who are implementing technology to involve parents and foster student collaboration. I am enjoying the breeze with the sounds of sirens and the hustle and bustle of the Austin downtown streets beneath me. 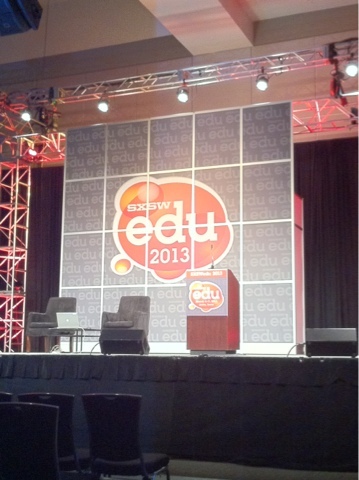 So much anticipation of the SXSWedu conference and I'm finally here! There's so much to do and so many people to meet...where do I begin? I'll be chatting with you soon!